The History Train’s caboose is the #414, built in the early 1920s. 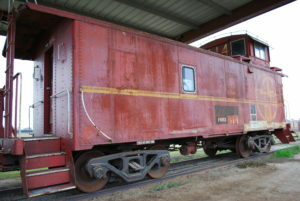 It is the first steel caboose Santa Fe purchased. The conductor would ride in the raised part of the the caboose called the cupola and watch for any overheated wheels on the train. If any were seen the conductor would signal the engineer to stop the train. the total weight of the caboose is about twenty tons. It was moved to the Double T by truck, from Portola, California.